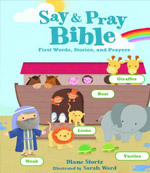 Today I’m CELEBRATING the release of my new book, Say & Pray Bible: First Words, Stories, and Prayers! 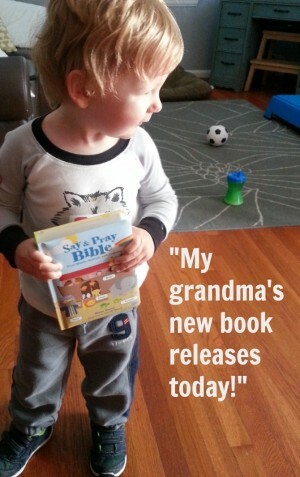 It is JUST RIGHT, truly age appropriate, for introducing little ones to God’s Word! There are 20 stories, 10 Old Testament and 10 New Testament. The stories are SHORT … just one sentence (or two very short sentences). Here’s one. Little baby Moses slept in a basket while his sister watched. But there’s also a Scripture reference (Exodus 2) plus a short Bible verse and a short little prayer. Thank You, God, for sisters and brothers! Amen. Did I mention the stories are SHORT?! Babies and toddlers LOVE turning pages. So that much text is about all they will absorb until they are older. Some days you might just read the stories. Another day, just the verses. Yet another reading, just the prayers. And some days, you might just talk about the pictures—bright, simple, whimsical illustrations by Sarah Ward. Objects in the artwork are LABELED (I am SO HAPPY about this!). Because toddlers love to POINT and NAME pictures of objects and people they are learning to recognize and say! It’s all wrapped up in a sturdy board book with rounded corners and a padded hard cover–practically indestructible! The little boy in the photos is my #3 grandson. 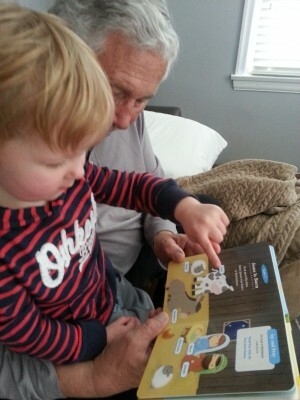 He loves his books and naming and pointing to objects in the pictures, and he was the inspiration for this book! I’m putting copies in the mail today for grandsons #2 and #4. And I’m praying for SOOOO many little ones to learn of God and hear his word (in many languages, I hope!) with this book for years and years to come! Want to know more? Check out the sampler and find links to retailers here. Congratulations. Can’t wait to see it! I know some little ones who will love this! Thanks, friend! Tell Julie to watch the mail! Congrats! Dan told me about the book; you always have such delightful ideas! Thanks, Michelle! That means a lot!! You are doing such great things for our children.